When you set out to find the best grinder for weed and herb there are some things you should keep in mind. You first want to make sure that it is designed with quality aluminum materials. Stay away from those coated with metallic alloys but the magnetic lids are a plus to reduce spills. Those with clear tops are also a plus as they allow you to see how much is inside. There are a lot of styles to choose from, they can range from colorful to clear to sleek metallic. The following will hopefully help you choose the one that is right for you. What is a grinder and how do you use it? Herbs usually are not going to be present in that form when they are purchased, although different merchants are going to process them in different ways. The emerging formal market for weed is going to produce a lot of different results.Those new to cannabis might be asking themselves questions such as, what is a grinder and how do you use it? A grinder is a tool used to break cannabis to smooth particles. You can grind your cannabis without a grinder but the final results will be very different. Grinder breaks your cannabis to finer particles for rolling or wrapping into papers. A grinder is fast and saves time. The most common grinder contains four components. There is the lid, grinder teeth, weed chamber also known as the flower and the kief catching chamber. It’s always advisable to always purchase a quality grinder. Avoid herb grinder or the acrylic grinders; they wear out fast because they are made cheaply. It highly recommended for you to purchase either zinc grinder or aluminum grinder. Remove top lid from your grinder. Break your cannabis using your fingers and place the buds evenly between the grinder’s teeth. Don’t put buds at the center directly – the lid will not lock due to the presence of cannabis on top of it. The lid is held by a magnet in place. Place the lid on top of the grinder teeth. Lock the lid and start grinding. Spin the lid around 10 times, until all the bud has fallen through the holes. Then remove the top of the grinder and tap it against the grinder to ensure that you have removed any stuck pieces from the teeth. The ground up buds is deposited in the flower chamber. Unscrew the chamber to find your freshly ground weed. If you want to collect most kief, place a coin on the screen contained in the flower chamber and shake gently; the weight of the coin will cause the kief to fall passing through the screen. You can now separate your kief chamber from the flower chamber. Once you collect the kief, scrape some out using a scrapping tool; scrap tool can be purchased with your grinder or separately. You can sprinkle a little kief onto joint, bong rip, blunt or bowl to make it potent. Ensure that your scrapper doesn’t scrap any aluminum or zinc particles with your kief. One of the great things about using a weed grinder is that people are going to be able to get the exact consistency that they want. They are going to be able to use the grinders that they want, of course, since this is a product that they have opted to largely process themselves. However, more importantly, they are going to be able to get their own weed to a state that will work for them. People consume weed in different ways. As such, they are going to need different consistencies for all of it. They are going to need to have finely ground weed in some cases. In other cases, they are going to need to have weed that has been processed at a different level. One way or another, it is important for people to have options. The benefits of using a grinder are such that people can truly get all of the results that they most want for themselves and the products that they use. There are lots of different types of grinders today. In a world where weed is becoming more socially acceptable everywhere, it is profitable to create a lot of different types of grinders, and so the people who are seasoned users are going to have a lot of options for weed before them. Sharpstone grinders are going to be some of the most popular and the most common. Acrylic herb grinders are also popular and common. The Cali Crusher is another common type of weed grinder that a lot of people use today. Many people favor the sharpstone grinders, which tend to be advertised more often than most others. These types of grinders are separated by a number of different factors. Their composite materials manage to separate them. These materials are going to have an effect on how they grind the herbal product. With sharpstone grinders in particular, the aluminum content has a tendency to really create a finely chopped product. There is also the fact that people tend to like the shiny look of aluminum grinders. These types of grinders tend to be just as good at grinding tobacco as they are at grinding weed and other herbs, making them versatile. However, the grinders that are made from other materials, such as acrylic, might be less expensive for some people. As such, they are going to be easier to purchase and more cost-effective. There are lots of different choices for people today, and that is usually the most important thing. There’s a lot of benefit to buying a grinder to help break up your weed. But there are a variety of different styles of and materials used for grinders and they don’t all offer the same performance or smooth grind. You’re probably familiar with the aluminum single compartment grinders at your local gas station or head shop, but those are pretty bottom of the barrel. So, to help you find the best herb and weed grinder, here are a few tips to keep in mind. Grinders are made of either acrylic, wood, or metal. Acrylic grinders are cheap but also tend to break quickly. Wood grinders are terribly cool looking, but are nearly always one chamber and don’t grind evenly. The best herb grinders are made of aluminum. Some will have a coating (such as titanium) inside to make them more durable. These grinders may be two or three chambered. How many chambers does it have? Grinders can have either one chamber (with the grinder consisting of two parts,) two chambers (with the grinder made up of three parts,) or three chambers (with the grinder made of four parts.) One chamber grinders are the easiest to come by, but they produce uneven pieces and can take longer to get a smooth grind. Two chamber grinders have small holes at the bottom that allow fine particles to fall through. This ensures smooth and even consistency. Three chamber grinders have a screen at the bottom that allows for the collection of kief, while still letting you get that smooth, even powdered herb. The number of chambers a grinder has determines how fine of powdered herb you’ll get and whether or not you’ll be able to collect kief. If you break up your weed by hand, all the kief sticks to your fingers and is lost. If you want to make hash, which requires kief, you’ll want a three chambered grinder. If you just grind and vape or smoke, then a two-chambered grinder will suit you fine. One chamber grinders are good if you’re not too particular and just smoke. If you keep these tips in mind, you’ll be able to find a great herb and weed grinder that suits your needs and taste. * After grinding up your product, turn the unit upside down and continue to grind. This will enable the grinder to continue grinding to an even finer finished product. * Hold the grinder at a 45-degree angle, lid pointing down, and the material will build in the corner. To continue getting a finer finished product grind in this method for a few second more. Our number two pick for best weed grinder is the Space Case Grinder/Sifter Large. These grinders are built to last. Their teeth are designed not to dull and are designed with a screen that will not clog. Manufactured in the United States this grinder is state of the art as it is created from aircraft grade aluminum. With its razor sharp teeth and grinding movement smoother than glass you are guaranteed it will cut through the toughest herbs. The Space Case Grinder features anodized titanium coating offering extra strength over many other models in its class. This finish will also prevent sticking so your product doesn’t get stuck in the teeth, making it much easier to clean. With sifter chamber, pollens are separated giving you perfect consistency for vaporization. Reviews of the Space Case are very favorable. One reviewer compared the tightness of the teeth to that of an M16 and states it will shred anything to a fine fluff. The only negative statement was the moisture buildup tends to make it hard to turn, but even this reviewer stated it was not anything major and still voted this a top grinder. Another review states this top of the line for grinders. They were not able to say enough positive comments in their review but did say they will be recommending this product to all their friends. The only negative comment found was regarding the price was a bit high, but even this review said it has turned out to be well worth the money. One reviewer considers this model to be an investment as it has been built to last. With its precision machined aerospace grade aluminum they are convinced there is no other like it on the market and plan to continue using this for years to come. They have been using their unit for more than a year and have not broken a tooth on it yet. The screened chamber holds 14g + of shredded material which is working great for their use. The Space Case Grinder is made from quality materials that have proven to last and stand up. These grinders are designed with diamond cut teeth and feature neodymium magnets. This grinder comes with a Cali Crusher press. A review on this grinder states it is top of the line and the fabrication is so perfect that every piece threads easily into the other. Any type of herb can be ground up with its very sharp teeth in just seconds. The magnetized lid is so strong, even when accidentally dropped it stayed in place and none of the herbs inside came out. This reviewer states it is a “must have” grinder especially if you grind frequently. Another review calls this grinder amazing and durable and they recommend it 100%. It shreds their material to a wonderful consistency and the retention of pollen is unbelievable. The only negative review found was concerning the strength of the magnets; however, following reviews disputed this statement. Another reviewer calls this unit a “must have” piece of equipment and they will only recommend the Space Case brand of grinders. The name speaks for itself when it comes to the amount of material it will yield. They had previously used different types of Grinders and say it worked good, but nothing like the efficiency of the Space Case. The Space Case grinds with ease and there is no alternative for them when it comes to best herb grinders. This precision machined grinder is from the highest quality aerospace aluminum and has super sharp cutting edges that do not dull. The lid is magnetized providing optimal grinding with superb consistency. They have added an industrial strength micron mesh screen to enable catching all pollen. One review spoke poorly on the strength of the magnet; however, this was disputed by several other reviews claiming its performance was outstanding. They state if you are serious about grinding your own herbs and weeds, this is the machine you need to have. The price was the only other negative comment found and it too was disputed stating the craftsmanship of this unit is well worth the price. One reviewer says they were mesmerized when their unit arrived as the finish and craftsmanship were outstanding. The grinder worked so flawlessly and ground their material to a proper consistency and the pollen retention was absolutely unbelievable. They recommend this grinder 100% with it smooth grind and the fact that it catches a ton of pollen. 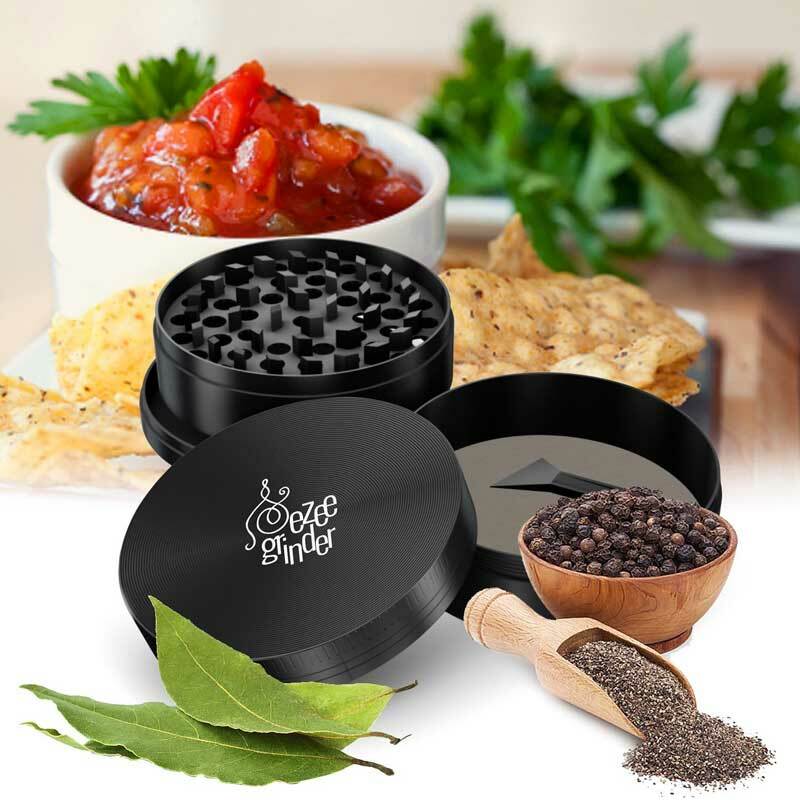 Without a doubt, Space Case Grinder/Sifter are the best herb grinders when it comes to the combination of material and price. The grinder is too large to be categorized as medium. Not all people love the large grinders. Cali is becoming popular in the industry for their outstanding quality, and affordable prices. This Cali Crusher Herb Grinder contains four stages, micron count screen, razor sharp teeth and neodymium magnetic closure. This fantastic grinder is made from heavy duty aircraft grade billet aluminum with a stainless steel screen. This grinder comes with custom pollen scrapper and is anodized black. Customer review of this product states it is a perfect size and very well designed. All pieces fit together perfectly and the top just pops off enabling you to insert your product. Grinding is easy, even if packed and has a little scraper which works perfectly. One review states this grinder is solid and does not feel like junk. They love the 4 chamber design and screen to catch the pollen. One negative remark found for this grinder was having to clean around the threading of the case to prevent metal shaving from entering the grinding. They state it was not a problem and still rate this grinder as a quality product. Another negative remark was the fact it was made in China, but after using the unit and experiencing its quality, this fact was not a problem. Anyone looking for a grinder that is easy to use, this one was recommended to them. They love the 4 chamber design and the teeth made of a very strong alloy. This VA grinder has gained a reputation with its incredible build and a design that is dependable. Blades are razor sharp Diamond Cutting Blades to enable it to cut any type of herb. This is an exclusive grinder made from aircraft grade aluminum and uses the newest CNC machining technology. The VA grinder has a smooth finish so there is never any wear or smudging. A reviewer of this product states the quality of the VA Grinder is fantastic with its fiction free operation. Everything is ground smoothly and evenly, providing fluffy herbs every time they use it. It is large enough to hold a lot of herbs as it has deep reservoirs that collect the herbs and pollen. There is a life warranty on this product, so you can’t go wrong with this wonderful herb grinder. Another review stated they were tired of eating out and decided to eat more at home meals. They were so excited to get their grinder and start making their own quality herbs to use in cooking meals. Its overall solid structure is a pure delight in their kitchen. A reviewer states there are many over-priced grinders on the market, but they assure everyone this one is the last one you will own. With its ability to grind fresh or dried herbs this unit will provide you with any material you could possible need. The cleanup with this grinder has also been considered as a real bonus when grinding your own herbs. This top quality shredder comes with chunky metal teeth that never dull and never snap. With its magnetic closures, the Sharp Shredda keeps your herbs fresh and does not allow for spillage. It will shred and fluff in seconds anything from tobacco to spices or any kind of herb you choose. The high-quality pollen filter catcher is included with a non-fraying mesh screen. Included with this grinder is a scraper and carrying pouch. One reviewer states their friends were all jealous when they saw this incredible grinder at work. Many of them went out and got one of their own. It grinds up everything they want it to quickly and finely. Another says the sap catcher is purely ingenious and the steel screen inserts filters out a ton or sap. The only negative review found for this grinder was on the price and that it is somewhat hard to clean. Another reviewer considers the design of this unit revolutionary providing quality results with little effort. They have made premium pollen filter designed to catch heaps of super fine pollen which comes out easily. The reviewer went on to state this is by far the finest grinder on the market. It has a stylish aluminum finish and fits perfect in the hand and pocket. As the name suggests this grinder has a premium design with 49 diamond shaped teeth. This grinder has a 4-piece, three chamber design that will filter your herbs. The lid has strong neodymium magnet to keep it firmly in place during grinding and prevents spills. Black Tie Grinders are made of one solid piece of aluminum which is CNC aircraft grade. The Black Tie Grinder is a classy product which exudes class. It will grind anything with its diamond teeth as the micron steel mesh screen filters out everything. One review states this grinder has more teeth than any other they’d seen and were impressed how finely their herbs were ground. The collection area contains three chambers which enable it to hold more than other grinders. The maker of the Black Tie grinder is a small business and it is vital to them to achieve customer satisfaction. They have made it their goal to deliver a premium product and offer a 100% money back guarantee. There were no negative reviews found on this product so it appears they are fulfilling their goal. A review says the Black Tie Company pays attention to detail and it shows in the craftsmanship of their grinder. Many other grinders they have seen cannot compare to build or the finish of the Black Tie unit. They consider the Black Tie to be the perfect balance of price and quality. This is a high-grade aluminum constructed grinder that uses the latest in metallurgy science. The AfternoonDelight grinder has a larger and deeper herb compartment than most others on the market allowing for you to get a more finished product. It is also designed with internally curved corners so you are able to get every bit of your product out. The grinder has a magnetic lid to keep contents from falling out, even if you turn it completely upside down. A reviewer says they love all the non-stick coating allowing them to clean the grinder easily. It is also said the well thought out design withstands abuse and its aluminum construction makes for a light and easy to use product. Another writes how much they like this grinders design. It comes apart easily into multiple pieces making cleanup really easy. There were no negatives reviews found for this grinder. Other reviewers list how much they like the nonstick coating with this grinder so the material does not get jammed up inside of it. It comes with a small guitar pick style scraper that works wonderfully to clean off hanging material. One suggestion with the AfternoonDelight to receive an even finer product was to run the material through twice for an extra fine grind. If you put a nickel on the screen it will send more pollen to the base. This grinder has been rated number 1 by Amazon with its precision milled, aircraft grade anodized aluminum. This grinder is scratch resistant with its black finish that prevents flaking or peeling. There are 49 diamond sharp metal teeth for extreme and efficient grinding. The teeth are perfectly placed with the design of this unit so that it does not rip or shred material. The grind motion is silent, smooth and quiet. Powerful neodymium magnets hold the lid in place to keep your herbs fresh and the scents inside the grinder. Reviews on this product state they are more than satisfied with the performance of this ultimate grinder. Greens are ground up to a nice powdery texture. Others say they like the feel of this grinder as it feels like it has some heft to it, not like a pocket grinder at all, feels more like quality. The only negative remark found it that it is not safe around children as the teeth are razor sharp. After reading through the information on the above grinders it is shown there are a lot of similarities between the products. The important features such as the screens seem to all work very well in each and they all use the aircraft-grade aluminum to create a solid, long lasting product. Size does seem to be a difference and would be something a user would want to know before purchasing to make sure it will fit their needs. The prices widely vary also and will play an important fact in which one will fit your budget. They all have received very high ratings in their reviews and it was difficult to find any negative comments about any of them. Choosing the one that is right for you will come down to how much you can afford and what size you require. The quality will be in any choice you make. Herb.co – This page has a lot of information about herb grinders. Hail Mary Jane– This is the ultimate resource for herb & weed grinders. Grasscity Forum – This is the best weed grinder discussion forum. Every grinder you have on this site is great. Thank you for liking and commenting on my posts.